National Grid consults on ancillary services reform: will the changes go far enough? The UK electricity system was designed to transport electricity produced in a relatively cheap and predictable way from centralised power stations, to users whose patterns of consumption are similarly stable and predictable. Variations around these patterns of production and consumption were typically small, and managed by the system operator (National Grid) through a set of balancing and ancillary services. As the electricity system becomes increasingly de-carbonised (renewable generation) and de-centralised (embedded generation) both the supply and demand sides of the market have become far less stable and predictable, making the process of system balancing significantly more complex. According to National Grid, the system, needs are increasing, and becoming more volatile and uncertain at the extremes. As the energy mix changes, the availability of flexibility in the Balancing Mechanism (“BM”) is falling and/or becoming more expensive to access. Market participants on the other hand find the current suite of balancing and ancillary services to be complex, unclear and not future-proof, and the expectation that the market structures will change is inhibiting investor confidence. Change however is necessary, since the current framework means that the true costs of delivering electricity in all periods is not reflected in the prices of the energy and balancing markets. The value of flexibility is not being fully reflected in existing market structures. Fees for ancillary services are set in advance by tender or bilateral agreement, and apply over longer periods, with a month generally being the minimum term. This means that prices are not very well correlated with market conditions at the time of use, and penalties for non-delivery tend to involve forgoing a portion of the fees rather than reflecting the actual cost of the service in real time. Prices of ancillary services are also published retrospectively if at all, and the information provided is geared more towards explaining system costs rather than signalling areas of need and value for providers of such services. There have also been controversies, where delays in making certain ancillary services contracts public have been seen by other market participants as conveying unfair advantage to the parties to those contracts. In response to these concerns, National Grid published its System Needs and Product Strategy consultation on 13 June, setting out its strategy for the types of services it will need to balance the grid in future, while maintaining secure and affordable electricity supplies. A key driver for the need for balancing and ancillary services is the intermittency of wind and solar generation, as their output varies in real time. It would therefore make sense to align the duration of ancillary service provision to the duration of the underlying need, meaning that efficiency could be greatly increased by reducing contract duration, even to the settlement period level (half an hour). This would enable prices for ancillary services to be set for each settlement period, providing more complete price signals regarding the true cost of delivering electricity in that period. Investors would benefit from greater visibility on the need for various services, while the system operator would be able to impose non-delivery penalties that reflect the actual system cost of the failure to deliver in that specific settlement period. This approach is taken in other markets, where ancillary services are co-optimised alongside energy markets in each trading interval. 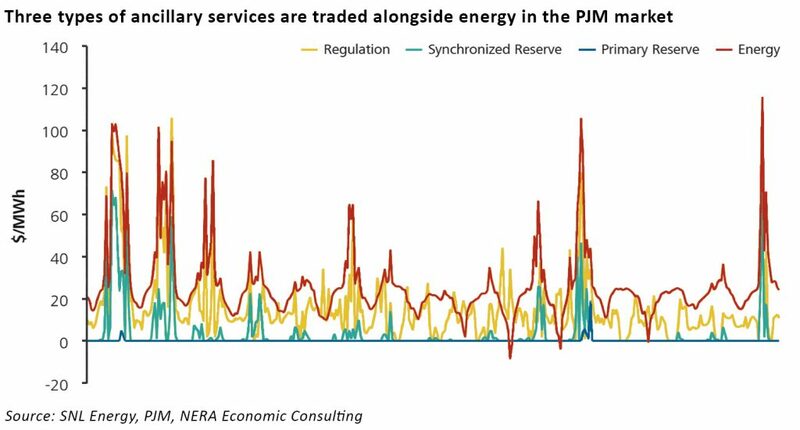 For example, in the PJM market, three types of ancillary services are continuously traded alongside energy as illustrated in the chart below. Some markets recognise the value of flexibility within their capacity markets. PJM has introduced a “Capacity Performance” product while ISO New England has a “Pay for Performance Mechanism”, both of which are designed to ensure the reliability of capacity provided to the system. However, capacity markets arguably become redundant if energy and balancing markets fully reflect the cost of delivering electricity in all periods. National Grid proposed in its consultation to rationalise the existing suite of balancing services products, standardise contract terms and improve the product suite based on feedback from the industry. Alongside the improvements to the product portfolio, National Grid intends to improve its communications with the market around its procurement processes. National Grid recognises the feedback from market participants that shorter duration contracts can provide greater flexibility to the system operator with investors seeing more opportunities to provide services, although this contrasts with the need for long-term revenue visibility that typically underpins investment decisions. Large sources of inertia which help to dampen frequency changes are being retired, and placed with non-synchronous, intermittent generation which not only provides no inertia, but which directly causes frequency fluctuations. The lower the level of inertia on the system, the faster the frequency can change. Some distributed generators have protection relays in place which will disconnect them from the system if a high Rate of Change of Frequency (“RoCoF”) is detected. This can lead, in a worst case scenario, to uncontrolled disconnection of large quantities of generation causing a partial system shut down. As the entire system is designed to operate within a frequency tolerance of ±1%, new approaches to managing system frequency and changes in system frequency are required. Currently the most efficient way to manage RoCoF is to limit the largest credible loss, which is achieved by trading, or by taking BM actions to reduce the level of the generation or demand that comprises the largest loss, for example by reducing the output of one generator and increasing output elsewhere, or by limiting export on an interconnector. This approach is considered to be more economic than adding new sources of inertia to the grid. National Grid is exploring physical approaches to manage the impact of reduced inertia though desensitising distributed generation relays to make them less sensitive to the rate of frequency change. The use of new hybrid synchronous compensators is also being explored. 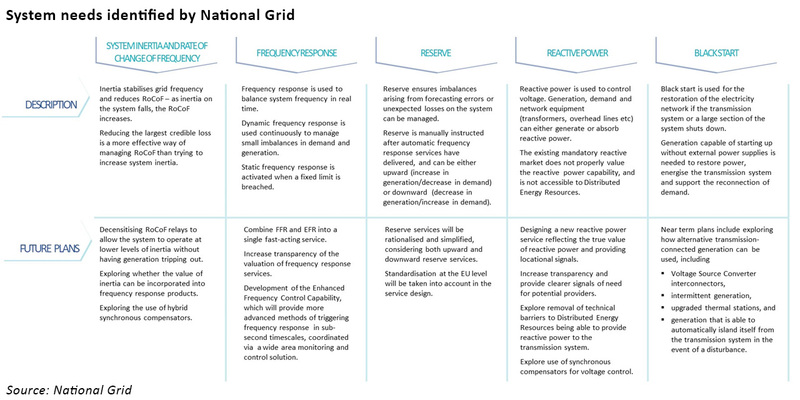 In addition, National Grid is considering attributing value to inertia in its frequency response products. The range of frequency response products is also set to change. Last August National Grid held a trial tender for a new frequency response service (Enhanced Frequency Response (“EFR”)), designed to provide faster response times than the existing Firm Frequency Response (“FFR”) and Mandatory Frequency Response (“MFR”) services. In the trial, National Grid procured just over 200 MW of response capacity under 4-year contracts from (unbuilt) battery storage projects. There was a high level of interest in the auction, however concerns were raised over both the size of the auction, the short tenor of the contracts and the low clearing price. National Grid has decided not to hold a second trial, but instead plans to combine both EFR and FFR into a single service which would be procured closer to the point of use, allowing it to be better aligned with the needs of the system. The reserve service is used to manage imbalances that arise from forecasting errors or unexpected losses on the system. It is manually instructed after automatic frequency response services have delivered, and can be either upward (an increase in generation/decrease in demand) or downward (a decrease in generation/increase in demand). National Grid is also exploring reforms to its reserve services as the current services have overlapping delivery timescales and different technical characteristics, which it feels inhibits transparency and the overall market opportunity. New reserve products are needed to ensure sufficient flexibility is available close to real time, and that the market can be accesses by both BM and non-BM providers. Compatibility with pan-European reserve services also needs to be taken into account. Changes are also being mooted to the reactive power service that is used to control voltage on the power grid. Generation, demand and network equipment (transformers, overhead lines, cables, etc) can either generate or absorb reactive power, which needs to be balanced to maintain voltage at the right level. When transmission demand is low, electricity networks tend to generate reactive power, increasing grid voltage. Conversely, when transmission demand is high, networks will tend to absorb reactive power, reducing voltage. Voltage is a local property of the system so the requirements can vary between different parts of the grid. Reactive power is currently managed using network assets such as reactors and capacitors, and the mandatory provision of reactive power from generators in the Balancing Mechanism. According to National Grid, most voltage control challenges occur in the summer when demand is low and fewer flexible generators are running. The locational nature of reactive power means on occasion, synchronous generation is required to start up in order to provide reactive power absorption and therefore other generation must be turned down to keep the system balanced. National Grid is of the view that the current market does not properly value this service and so intends to design and launch a new service. Another service that needs to be re-considered in light of the changing structure of the grid is the black start service since traditional thermal providers of the service have been closing due to unfavourable economics. Black starts are required to restore power to the grid following a blackout, and have typically been provided by conventional thermal power plants with on-site diesel generators that can be used to start the station turbines. National Grid is exploring different ways of re-starting the grid following a blackout, including using islanded generation that can be separated from the rest of the grid, upgraded thermal plant that can provide the service at lower load factors, and even renewable generation. The current black start procurement strategy is due to be published this summer in order to improve market transparency – there has been criticism that the service has been used as a means of retaining otherwise un-economic capacity on the system. While this consultation is a positive step, it will be interesting to see whether the resulting changes will go far enough. Last year the Policy Exchange proposed that trading should extend closer to delivery, to allow more balancing actions to be taken in the wholesale markets. Nodal pricing was also proposed to ensure that electricity trading did not ignore physical constraints on the system. Both of these steps would increase the transparency of the market. Reduce complexity: ancillary markets should be rationalised and simplified to reduce complexity. Follow system needs: ancillary markets should be designed to address specific system needs at both transmission and distribution level, reflecting both new system issues (such as excess summer generation) as well as well-established issues (such as ensuring there is enough capacity to meet peak demand). Create liquid markets: where possible, ancillary services should take the form of liquid, traded markets, with multiple buyers and sellers of a particular service – the Balancing Mechanism being a good example of such a liquid market. 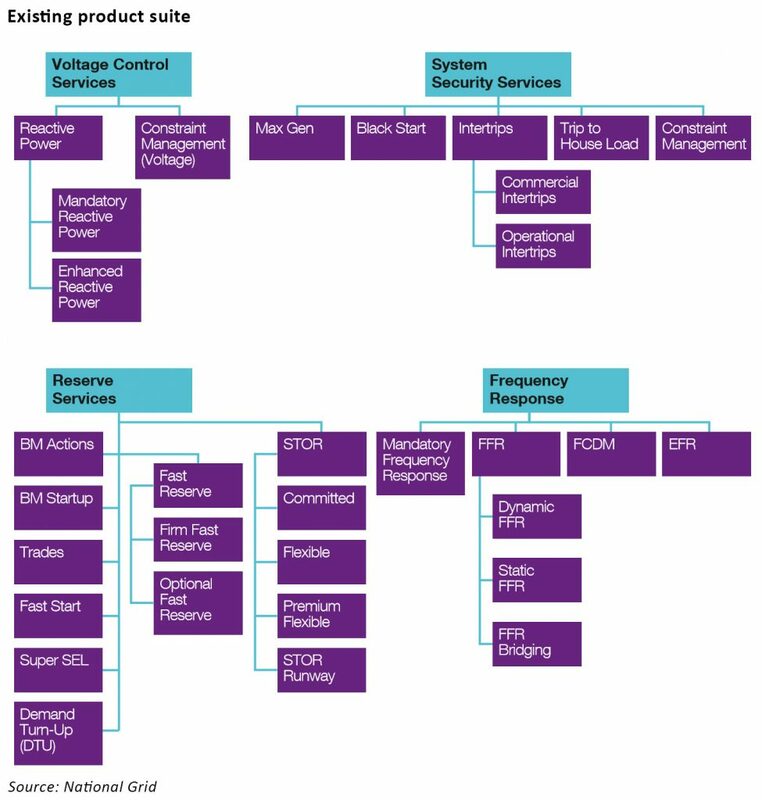 Both the system operator and DSOs could procure flexibility through a common trading platform. Open, technology neutral markets: ancillary markets should be open, competitive, and technology-neutral, identifying the cheapest technologies able to meet system needs. Transparency: The system operator and DSOs should provide greater transparency on current and future system needs, including an indication of the requirements for ancillary services and the timing of future tenders. National Grid would do well to follow this framework. A more transparent, market-based approach to managing the electricity grid will provide appropriate investment signals to market participants, allow for the effective use of new technologies and approaches, and ultimately deliver improved value for consumers.